The Christina River watershed is one of four major watersheds in the 565 sq. mi. Christina Basin. The Christina Basin is part of the 13,000 sq. mi. Delaware River Basin. The White Clay, Red Clay, and Brandywine creeks are tributaries of the Christina River and flow southward out of the Piedmont geologic province in Pennsylvania and into Delaware near Newark, Yorklyn, and Wilmington, respectively. The headwaters of the Christina River lie within the state of Maryland and enter Delaware west of Newark. The Christina River is tidal from just south of the town of Christiana to its confluence with the Delaware River at Wilmington. The Red and White Clay creeks converge in the vicinity of Stanton, Delaware, and the combined flow empties into the tidal Christina near Churchmans Marsh. Extensive tidal freshwater wetlands, including Churchmans Marsh, exist along the lower Christina. The Brandywine Creek flows through Wilmington and enters the Christina River just before the Christina flows into the Delaware River. 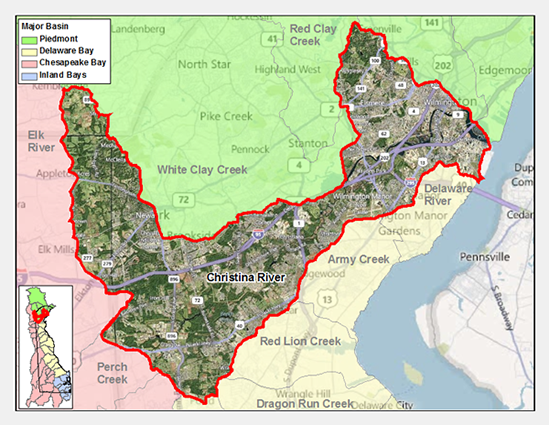 The majority of the Christina River watershed is located in New Castle County (DE). Lower portions of the Christina River are under tidal influence. The towns in the Christina River watershed include Newark (DE), Elkton (MD), London Britain Township (PA), and Franklin Township (PA). 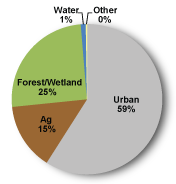 The Christina River is the most urbanized watershed in the Christina Basin with 59% urban/suburban followed by forest/wetland (25%) and agriculture (15%) uses. Collectively the White Clay, Red Clay, Brandywine and upper Christina are used to supply drinking water to more than 50% of New Castle County's population. United Water Delaware (UWD) operates the Christiana Water Treatment Plant. It provides drinking water to the UWD southern service area that extends from I-95 south to the Chesapeake and Delaware Canal. This water treatment plant draws water from Smalleys Pond, storage volume 40 million gallons, and is allocated to withdraw and treat 6 million gallons per day (mgd). The water is distributed to residential, commercial, and industrial customers within a service area that stretches from the Pennsylvania state line in northeast New Castle County to the northern edge of the Chesapeake & Delaware canal. The watershed is the site of the Port of Wilmington, an important shipping link, and one of the largest importers of orange juice, Chilean grapes, bananas, and automobiles nationally. The tidal waters of the Christina River support a striped bass fishery and spawning grounds. The nutrient and bacteria TMDLs for the Delaware portion of the Christina River requires varied reductions based on the stream segment of between 0-62% reduction in nitrogen, between 0-77% reduction in phosphorus and between 29-95% reduction in bacteria. The Christina River Watershed has a total of two hundred and fifty-nine sites listed in the Site Investigation and Restoration Section database. There are eighty four Brownfield program sites, seventy-eight sites in the Voluntary Cleanup Program (VCP), seventy-four state-fund lead (HSCA) sites, seventeen sites that have undergone a preliminary assessment / site inspection (PA/SI), four sites listed as a Formerly Used Defense Sites (FUDS) and two National Priorities List (NPL) sites. In water bodies of the Christina River Watershed, samples have indicated that PCBs, dieldrin and chlordane are present in the environment at levels requiring further attention under the Clean Water Act (1972). The Christina River Watershed is on the 303d list of impaired waters as well as having State of Delaware Fish Consumption Advisories for PCBs, dieldrin and chlordane. If you would like to view reports for any of the sites in the SIRS program please follow the link the DNREC Environmental Navigator to search by map for the Christina River Watershed. The Christina River watershed lies primarily within the Atlantic Coastal Plain, which consists of an unconsolidated mass of caustic sediments that increases in thickness south of the geologic Fall Line. An urban renaissance along the Christina is underway resulting in the Riverfront Arts Center, Tubman-Garrett An urban renaissance along the Christina is underway resulting in the Riverfront Arts Center, Tubman-Garrett Riverfront Park, Christina Riverwalk, factory store outlets, restaurants, the Wilmington Blue Rocks minor league baseball stadium, urban wetland restoration and the DuPont Environmental Education Center's wildlife refuge.